If East Stirlingshire’s squad is made up of typical footballers, who prefer playing to training, the pre-season schedule devised by head coach John Sludden should be music to their ears. Eyebrows were raised when Shire began their practice games ahead of the new Lowland League campaign with a 3-1 victory over English non-league side Frickley Athletic barely a week after their return from the it summer holidays. But Sludden is a believer in the principle that players will get themselves match fit for the season ahead by playing matches, and has underlined that by setting up a pre-season schedule that will include two games almost every week until the big kick-off. Shire are back in action tonight (Thursday) when they play a closed-door game against SPFL League Two side Albion Rovers and the matches continue this coming Saturday with a friendly meeting with East of Scotland League side Tynecastle. “Every coach of a football club will have a different way of doing pre-season,” Sludden said. “I believe the best way to get the players’ fitness levels up and to get them match sharp is to play matches. “We will be playing league opposition in Albion Rovers and Falkirk as well and it’s important that we get quality opposition for these games because we want them to be tests for us. “The harder these pre-season games are then the better chance we have of getting the season off to a flyer. There is no doubt the boost that debut striker Ross Allum got from the Frickley encounter after he notched all three goals against the English Northern Premier League club, becoming the first Shire player in 50 years to score a hat-trick in his first outing for the club. Allum wasn’t the only Shire new boy making his debut against Frickley with Danny Ashe, Chris McKee, Paul McCafferty and Robbie McNab all in the starting eleven against the Yorkshire club. And Sludden is still hopeful of adding more players to his squad in time for the opening competitive fixture, the Irn-Bru Cup encounter against fellow Lowland League club BSC Glasgow at Alloa on July 29. 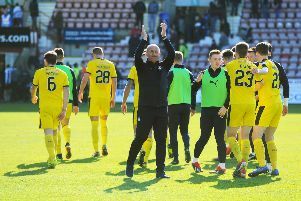 He will again hope to tempt Jamie McCormack and his own son, Paul, back to the club for another season and he has plenty of back up ideas if those talks do not bear fruit. “We have a few trialists who are with us right now who will be training and feature in the games and they will be given chance to impress us.